Formula Vee was such a great idea. Create a racing class that anyone with a little extra money and some basic mechanical skills could get involved in. If your driving skills were good, you could win a race or two, too. If not, you still had a lot of fun for not a lot of money. Conceived in 1963, by 1966 Formula Vee was ranked 3rd out of the 17 SCCA classes, in terms of numbers of racers. 44 years later, even though there are now some 30+ classes, Formula Vee still ranks 3rd on the overall SCCA list. Formula Vee is a popular racing series throughout the world. More than a few now famous racers got their start in Formula Vee, including Arie Luyendyk, Roger Mears, Bobby Rahal and Niki Lauda. 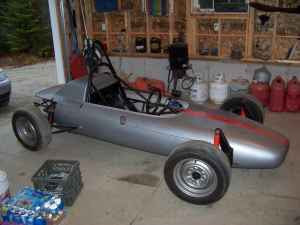 This car is a 1964 Auto Dynamics Formula Vee. This car has been restored. 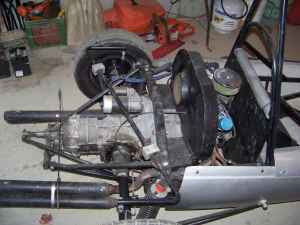 The 40 HP Volkswagen engine and 4 speed transmission (mounted "backwards", as they are on all FV cars) have been rebuilt. The the brakes and suspension are new. The body has new paint. The seller says that it still needs a battery and some new tires. This car may be too old to still compete in Formula Vee, but as the seller says, it would be a great vintage racer or auto cross car. The asking price is $2500.00. Vintage races / autocross cars don't get much cheaper than this. Located in Gorham, ME, click here to see the Craigslist ad. A big thanks to JaCG reader, Boris, for pointing out this car. What a nice ride. From what I read off the 'net, Auto Dynamics started out around 1964, so this might be an early example. 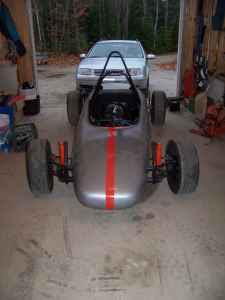 As the Ariel Atom came to mind, I looked up and searched "street legal" and "Formula Vee" together. Apparently making a car like this street legal would involve lighting, so you would have to add a charging system. From what I gather, even though the engine is air cooled, overheating problems can arise in stop and go traffic. Who knows? I think throwing on a set of oversized wire wheels, like on those old Auto Union race cars, would make this the bomb.